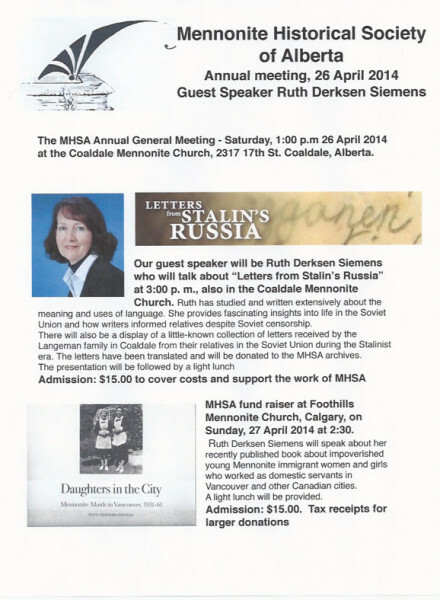 This conference marks the Mennonite Historical Society (MHSC) of Canada’s 50th anniversary. We welcome you to consider it in the context of two possible sets of books published by MHSC. First, the three-volume Mennonites in Canada series with the sub-titles of: 1) A History of a Separate People, 1789-1920; 2) A People’s Struggle for Survival, 1920-1940; 3) A People in Transition, 1939-1970. This conference, with the title, ‘A People of Diversity, 1970-2018,’ can be considered as a virtual fourth volume of this series. Two more recent MHSC-sponsored volumes were titled: 1) Mennonite Women in Canada; and 2) MCC in Canada’. This conference may also be considered in this vein, focused as it is on ‘Mennonite Diversity in Canada.’ In any case, this diversity can be seen in new ethnic identities, new forms of crossing old boundaries, and new ways of thinking about faith, culture and socio-political issues. This conference explores the significance of these changes since 1970 and considers the implications on being “Mennonite” in the 21st century. The Planning Committee: Marlene Epp, Brian Froese, Bruce Guenther, Laureen Harder-Gissing, Royden Loewen, Lucille Marr and Conrad Stoesz. Lodging: Suggested lodging is at Holiday Inn, Colony Street, Winnipeg. Phone 204-786-7011 and ask for special University of Winnipeg (Mennonite Studies Conference) rates. Parking: Impark parking lots around the University, the ANX Parkade off of Colony Street, or the Hudson’s Bay Parkade. Street parking also available. Past Mennonite Studies conferences: 2017, Mennonite/s Writing VIII; 2016, Mennonites, Land and the Environment; 2015, Mennonites, Medicine and the Body; 2014, Ex-Mennonite/Near Mennonite; 2013, MCC in Canada at 50; 2012, Mennonites, Human Rights and State Power; 2011, Anti-Modern ‘Horse and Buggy’ Pathways; 2010, Mennonites in Siberia; 2010, Mennonite/s Writing; 2009, Mennonites, Melancholy and Mental Health; 2008, Mennonites and Money; 2007, Family and Sexuality; 2006, War and the Conscientious Objector; 2005, North American Mennonite Historiography; 2004, Refugee Newcomers; 2003, Mennonite Studies: A 25th Anniversary Conference; 2002, Mennonites and the City; 2001, Mennonite-Aboriginal Relations; 2000, Return of the Kanadier; 1999, 1874 Revisited; 1998, EnGendering the Past; 1997, Mennonites and the Soviet Inferno; 1996, Mennonites as a People Transformed; 1995-1983, Various Themes. Roger Epp – Professor of Political Science at the University of Alberta and author of “We Are All Treaty People”, an exploration of what it means to live in the prairie West with a sense of memory, care, and obligation. He was an honorary witness at hearings of the Truth and Reconciliation Commission at Ermineskin First Nation. Millie Glick – Retired Co-Director of Mennonite Voluntary Service in Northern Alberta; mother of five, grandmother of eight; loves poetry, and is the author of “Bush Tales”. Ike Glick – Retired First Nations Community Development Specialist; He worked with Calling Lake residents to develop a local Health Centre, and with three other communities (Sandy and Chipewyan Lakes and Anzac) to establish schools. He became instrumental in socio-economic initiatives based on local skills and resources. Calvin Bruneau – Chief of the Papaschase First Nation, he is the elected chief and a direct descendant of Chief Papaschase. He was instrumental in ensuring that the City of Edmonton acknowledge the Traditional Burial ground and Fort Edmonton Cemetery. He is re-establishing the Papaschase First Nation.